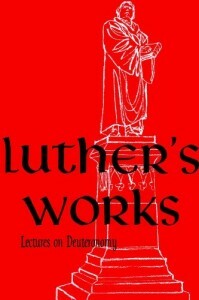 The following are my kindle notes and clippings from?Luther’s Works, Vol. 9: Lectures on Deuteronomy?by Martin Luther. Luther says: He adds also the nature of the Promised Land as a sort of promise, namely, that it is not like the land of Egypt but is under the special care of the Lord, whose eyes are on it from the beginning of the year to the end. The point is that He warns them to be dependent on God in faith and to know that through the favor of God the rain of this land is granted to the faithful and withheld from the unfaithful. We know that Egypt is not moistened by rains but by the flooding of the Nile each summer. This miracle of God, like all the others, has been belittled because of its regularity. In this Egypt differs from other lands by a remarkable distinction. But the Land of Promise has mountains and valleys; therefore it is made fertile, not through the flooding of the river but through moistening rains from the sky. ?God provides not so we may fatten our bellys; but so we may live on God’s Word. ?Wow. Another great picture of how rain is like doctrine. Luther says:?The seasonal and the later rains are also discussed elsewhere. The seasonal rain is the first rain; the late rain comes afterwards. That is how a joyful harvest and abundance of produce come about, when fair weather and the warm sun follow the rain; then, when it is very hot, rain again follows. For constant rain destroys everything, just as constant summer heat and warmth do. So also not only doctrine is to circulate among the people, but after doctrine the work of faith must be practiced. But where strength has slackened through labor and suffering, then the heart must be lifted up again, comforted, and consoled through doctrine. ?A great picture of how we aren’t to just learn and teach, but to also do. Luther says:?On the other hand, only to teach and not to do is just as if it were always raining, and everything choked and perished. Again, to labor and suffer and not to teach is just as if summer heat were to burn constantly and the waning strength of the spirit were being quenched. Therefore both rains are necessary, the early and the late, that is, teaching and exhorting. In Rom. 12:7-8 we read: ?He who teaches, in doctrine; he who exhorts, in exhorting. ?